As the United Kingdom struggles to decide the fate of their next government, one prominent figure from the center-left has the potential to offer unique insight into the role the Liberal Democrats and Labour Party could play. 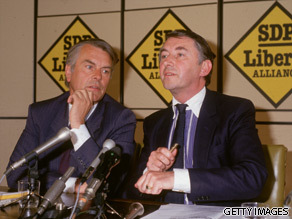 David Owen and David Steel are seen here in 1987. David Owen is a former British foreign secretary and member of the so-called "Gang of Four" - a breakaway Labour faction who founded the Social Democratic Party in 1981. Owen led the party from 1983 until 1987 when members voted in favor of a merger with the Liberal Party to form the Liberal Democrats. Owen quit the SDP leadership in opposition to the merger and led a re-formed SDP party from 1988 to 1990, when the party was finally wound up. Since the early 1990s Owen has sat in the House of Lords as a crossbencher, without affiliation to any party. Prior to helping found the Social Democratic Party, Owen was an influential Labour lawmaker, rising to foreign secretary in the Labour government of the late 1970s. But it is Owen's involvement in helping form the center-left SDP that he is best-known for. Owen left the Labour Party amid fears that the party was becoming an increasingly left leaning organization that was being heavily influenced by the unions. As a veteran political insider, Owen can offer a rare insight into the ongoing negotiations between the Lib Dems and both the Labour Party and the Conservatives.